This Item can be personalized with your name or a symbol of your choice. Please type in the Name you would like on your item and write a pm to us when you are interested in a custom symbol or design. 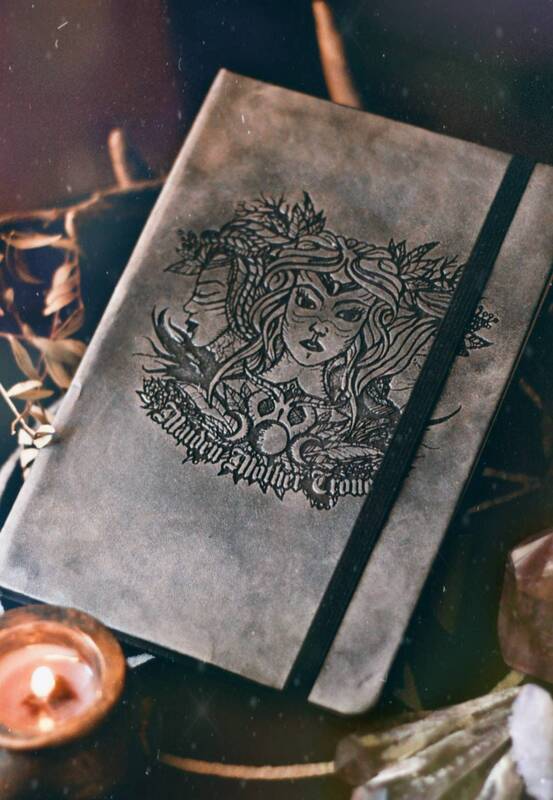 This is an Ancient Hearts original design on a custom vintage style notebook that you can use as a diary or a book of shadows. The Design shows maiden mother and crone. If you are interested in a custom book or personalisation please write a pm. Every piece is made to order and the vintage stain can vary in color a bit. I got my box today and it's somehow even more beautiful than the pictures. This was created with so much love and reverence for the objects inside. I could not be happier with it! Thank you! ..die Verpackung ist wirklich mit Liebe gemacht und die Schmuckstücke perfekt in Szene gesetzt. Ich liebe diese Box.. die Sachen sind wunderschön...super Arbeit...gerne wieder!!! Yes. If you need your tracking number and didn't get it with your Status update when the package shipped. Please dm us so we can provide you with the tracking info. How long do you need to send out my order? Every Item in the shop is handmade to order. The time I need to make an item depends highly on the amount of orders I have in the waiting line and also the type of order you send out. At the Moment the time for producing an item lies between 1 and 2 Weeks for some Items 3-5 days. You can find the info with every individual article. In rare cases it takes me a bit longer but if that should be the case I will inform you. If you need your order by a special date, please send me a message before you order so that we can make sure that it will get to you in time.